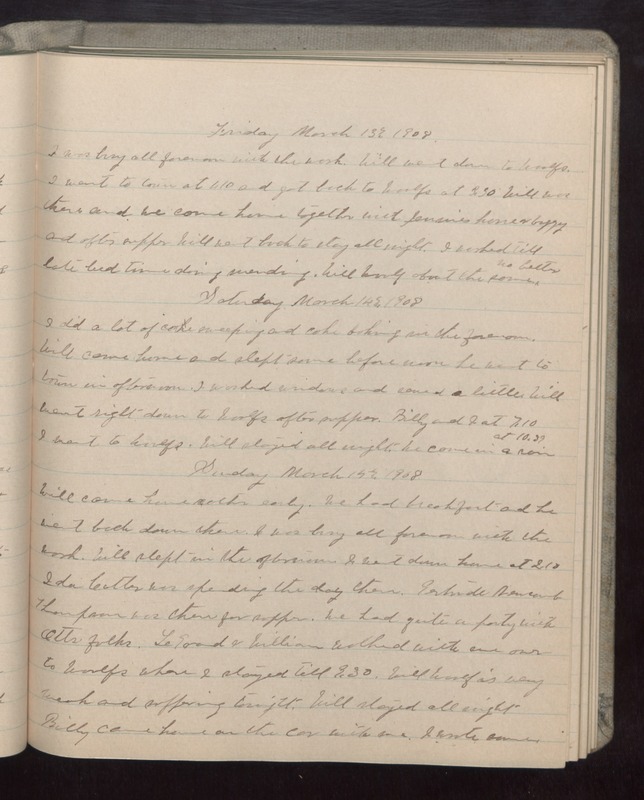 Friday March 13 1908 I was busy all forenoon with the work. Will went down to Woolfs. I went to town at 1.10 and got back to Woolfs at 3.30 Will was there and we came home together with [Jensen's?] horse & buggy and after supper Will went back to stay all night. I worked till late bed time doing mending. Will Woolf about the same, no better. Saturday March 14 1908 I did a lot of sweeping and cake baking in the forenoon. Will came home and slept some before noon he went to town in afternoon. I washed windows and sewed a little. Will went right down to Woolfs after supper. Billy and I at 7.10 I went to Woolfs. Will stayed all night. he came in a rain at 10.39 Sunday March 15 1908 Will came home rather early. We had breakfast and he went back down there. I was busy all forenoon with the work. Will slept in the afternoon. I went down home at 2.10 Ida [Colter?] was spending the day there. Gertrude [Newcomb?] Thompson was there for supper. we had quite a party with Otts folks. LeGrand & William walked with me over to Woolfs where I stayed till 9.30. Will Woolf is very weak and suffering tonight. Will stayed all night Billy came home on the car with me. I wrote some.